Near the autonomous public zone Metelkova mesto, lies a big platform. It is surrounded by three important museums: the Ethnographic Museum, National Museum of Slovenia, and the Museum of Contemporary Arts. In the middle there is an artificial amphitheater with grass banks where you can sit, chill and relax beneath the trees. Next to it stands a lime tree, a symbol of center of social life among Slavic peoples. The museum platform is quite popular among skaters as a convenient skating ground. Families with children come to play and retired people from a nearby nursing home chill out here. 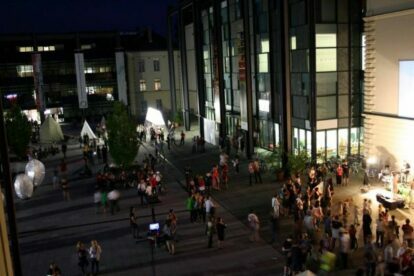 The proximity to the Slovene Ethnographic Museum café makes the platform even more popular, especially in summer when several festivals and events take place, like swing and salsa open air dance nights, first on Tuesdays, second on Fridays. One of the most interesting is Ljubljana short film festival (FeKK), happening last week of August, which showcases fresh films made in the countries of ex-Yugoslavia, retrospectives of proclaimed authors, matinees for the kids, workshops, lectures, hang outs, concerts and a lot of good cinematic fun most of it happening in the amphitheater.